In the quest to become more powerful and athletic, many athletes may be thinking that if they perform explosive exercises with added load, that when they go back to performing similar or sport specific movements at bodyweight, they'll be that much more explosive. This write up aims to serve as an introduction and reveal whether or not loaded explosive movements are necessary, and which types of athletes they are best suited for. I will focus my attention on exercises aimed a increasing the vertical jump and the sprint. For the vertical jump, examples of weighted exercises are: Olympic lifts, jump squats while holding dumbbells/ balancing a barbell on the back, or wearing a weighted vest. For sprinting, many athletes will use the aforementioned exercises, along with other methods such as sprinting with, or pushing, a weighted sled. While Newton et al (1999) determined that weighted jump squat training has been shown to increase force output and rate of force production, it is no superior than unweighted plyometrics in terms of increasing vertical jump height. Vertical jump training via resistive band training has demonstrated limited improvement in vertical jump height compared to plyometric training (McClenton et al, 2008). Jumping with a resistance band means that you are slowly your body down at a time when you want to be speeding up! On the other hand, resisted sprint training with a sled has been shown to increase an athletes sprint time over the acceleration phase, or initial 20 metres, of a sprint (Hrysomallis, 2012). As I discussed in this article: http://www.seandelben.com/2012/02/explosive-training-performance-advocate.html acceleration is just one of the key components of explosiveness, along with maximum strength, starting strength, and reactive ability. Why are towing & pushing sleds, along with the Olympic Lifts great for acceleration?? A short amortization (ground contract time) phase is one of the most important aspects of explosive movements such as jumping, and during the top speed phase of sprinting, however, a long amortization phase is critical for effective acceleration during the first 20 metres of a sprint, and during multi-directional sports. The reason why resisted training is so effective for training the acceleration phase of sprinting, is because this type of training increases the ground contact time and requires greater acceleration. This increased ground contact time is simulated while sprinting with resistance via a weighted sled, for example. It is important to make note that when training for the vertical jump, training with a weighted vest, with an added load only 10-11% of the athletes bodyweight may be the most effective method. A study by Khlifa et al (2010) found that the 'temporary hypergravity' or 'overspeed' effect imposed by the weighted vest on plyometric exercises led to superior results compared to an unloaded plyometric program. This can be explained by the faster eccentric muscle action that will result from your body's increased weight. Using a weighted vest compared to holding weights in the hands or on the shoulders also allows for greater safety, use of arm action, and use of more dynamic plyometric exercises for the experienced athlete. 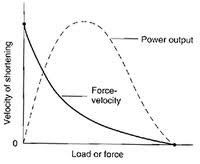 When taking into consideration the force/velocity curve, it is important to select a load that will optimize power output. In Supertraining (Siff, 2004), the optimal load in which to perform weighted explosive training is listed at 25% of the maximal force an athlete is capable of producing. However, an effective training routine should also periodically include a variety of resistances across the force/velocity spectrum. If you are training for an athletic movement that requires more acceleration and maximal strength (accelerating out of a cut, making a tackle, pushing a bobsled), then you should use explosive exercises with a greater load more often than movements that require short ground contact time. Movements that require more starting strength and a short ground contact time, such as jumping and top speed sprinting, should be trained with a greater involvement of explosive exercises utilizing a lighter load or no load at all. -When training for the vertical jump, use lighter loads of approximately 25% or less of maximal strength capabilities more often than with heavier loads. -When training for the vertical jump, resistance bands are LESS effective than both weighted and unweighted explosive exercises due to their increased 'drag' and negative effect on ground contact time. -When training for acceleration (up to 20 metres) during track events and multi-directional sports, weighted sleds are effective. Resistance bands should also be avoided here. -To make a well rounded athlete who is capable of demonstrating explosiveness in a variety of sport scenarios and body positions should perform explosive weighted movements with both light and heavy resistance, along with bodyweight exercises which stress reactive ability.